Many Albury locals would be aware of the “Hovell tree” at Nouriel Park. The old River Red Gum is known as the Hovell tree as the explorers Hume and Hovell marked the tree when passing in November 1824. What is not as well known is the river was in flood and they trekked up stream to above the Murray and the Mitta junction and then crossed both. Monuments have been erected near these crossing sites at the Lake Hume Village and Ebden Reserve. The crossing is recorded as occurring on the November 22nd, 1824. 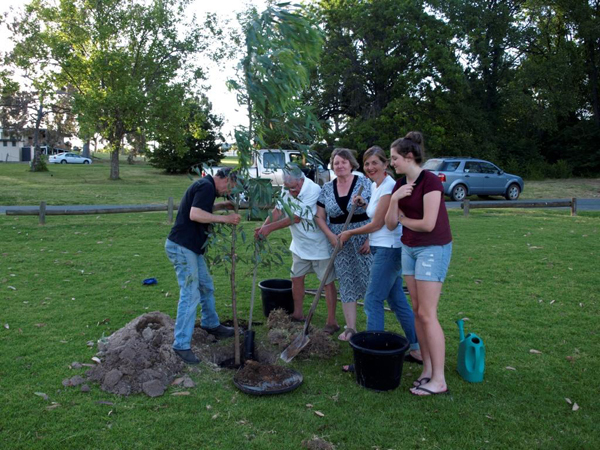 Albury City Council recently arranged for cloning of the Hovel tree and 100 new saplings were propagated and provided to various groups for planting (see http://www.alburycity.nsw.gov.au/www/html/17-news.asp?n=1475). 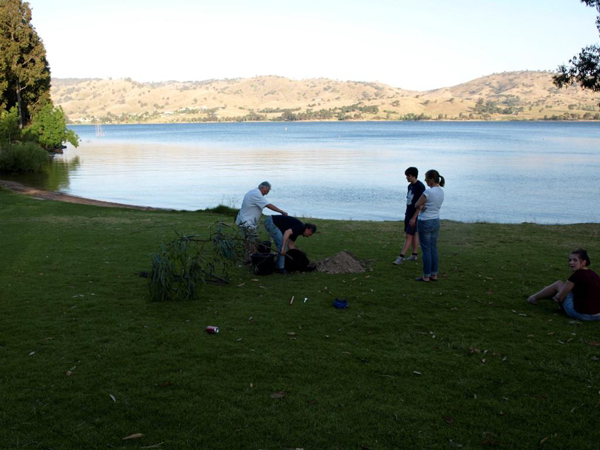 The Woolshed –Thurgoona Landcare group and “Friends of the Spillway Girders” arranged for one of these trees to be planted at Lake Hume Bay (the high level mark inlet immediately below Lake Hume Village). After liaising with Council and Tourist Park management, on 22nd November 2012, the 188th anniversary of the crossing, a hole was prepared for the tree and the tree delivered to the site. The following evening a small group of locals planted the tree, admired the wonderful scenery and wondered what the explorers had been encountering 188 years previously.